Yesterday was warm in the morning, but the skies clouded up early. It actually prevented some of the diurnal heating that I think the models suggested. Instead of widespread showers and thunderstorms, we got a few sprinkles and overcast skies. This morning has been overcast, rainy and mild. 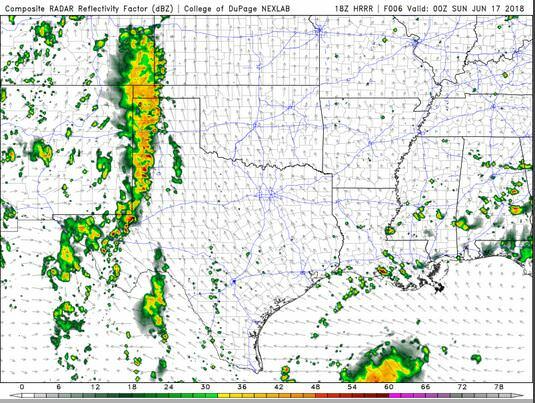 The NWS in Albuquerque, NM, forecasts (for Rio Rancho, NM) a cloudy day, with a 60% chance of showers and thunderstorms, and a high temperature of 76 F. The winds will be from the southeast at 5-10 mph. This evening will be mostly cloudy, with a 50% chance of scattered showers and thunderstorms, and a low temperature of 59 F. The winds will be from the southwest at 5-10 mph. 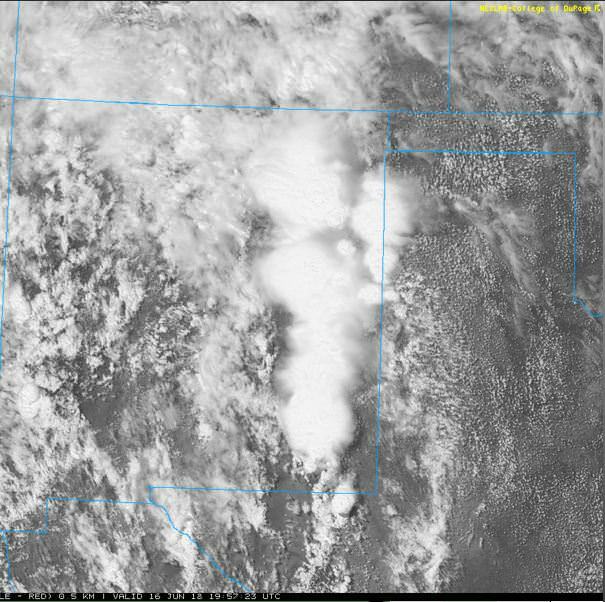 The NWS in Albuquerque, NM, forecasts (for Socorro, NM) a cloud day, with 50% chance of showers and thunderstorms, and a high temperature of 77 F. The winds will be from the southeast at 10-15 mph. This evening will be mostly cloudy, with a 30% chance of scattered showers and thunderstorms, and a low temperature of 60 F. The winds will be from the southwest at 10-15 mph, decreasing to 5-10 mph after midnight. 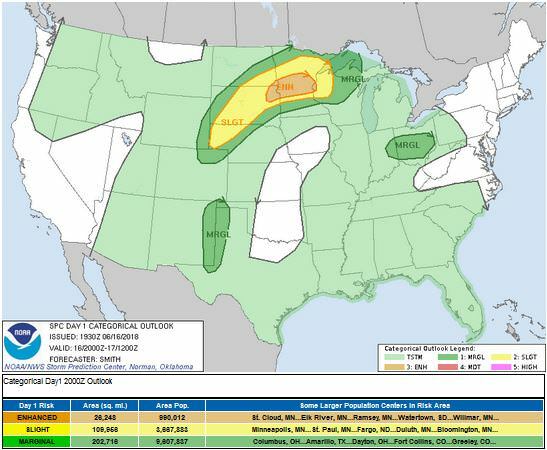 The NWS in Albuquerque, NM, forecasts (for Magdalena, NM) a cloudy day, with an 80% chance of showers and thunderstorms, and a high temperature of 70 F. The winds will be from the south at 15 mph. This evening will be mostly cloudy, with a 50% chance of scattered showers and thunderstorms, and a low temperature of 54 F. The winds will be from the west at 10-15 mph. The Storm Prediction Center (SPC) has issued a Marginal Risk for severe weather along the Texas border. The primary threats will be locally gusty winds. The visible satellite image shows that our skies look downright tropical, with all of Bud’s moisture overhead. Most of the state is under cloud cover. 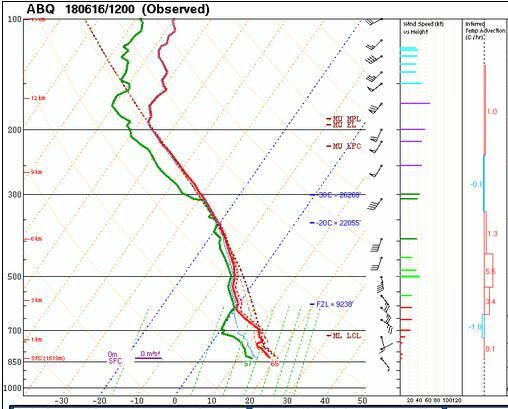 The 12Z upper air sounding from Albuquerque shows a saturated column between 600 mb and 300 mb. There was 1.07 inches of precipitable water present in the column. 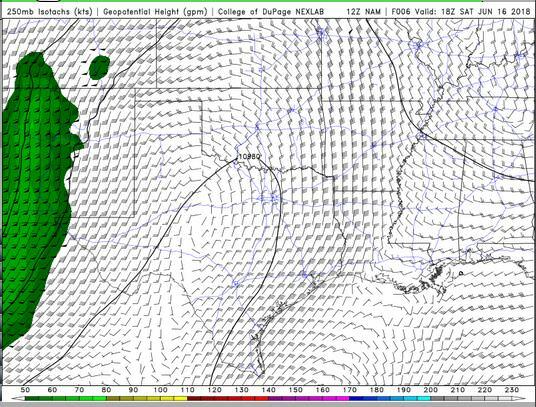 There was 265 J/kg of Convective Available Potential Energy (CAPE) and -27 J/kg of Convective Inhibition (CINH). The Lifted Condensation Level (LCL) was 574 m. There was no thermal inversion near the surface, and the 0-3 km average lapse rate was 6.9 C/km. 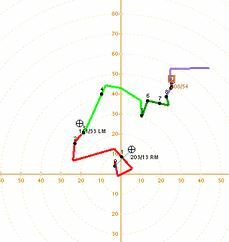 The hodograph shows that there was 6 kts low-level shear (due mostly to directional changes) and 37 kts deep-layer shear (due to a mix of speed and directional changes). The surface observations (from the SPC Mesoscale Analysis Map) show mild temperatures and high humidity, based on the dewpoints. The skies are cloudy almost everywhere. The winds are light, statewide. The Doppler RADAR shows a line of heavy precipitation in the eastern third of the state, and scattered precipitation elsewhere. The surface pressure chart shows no strong pressure systems or gradients over the state this morning. 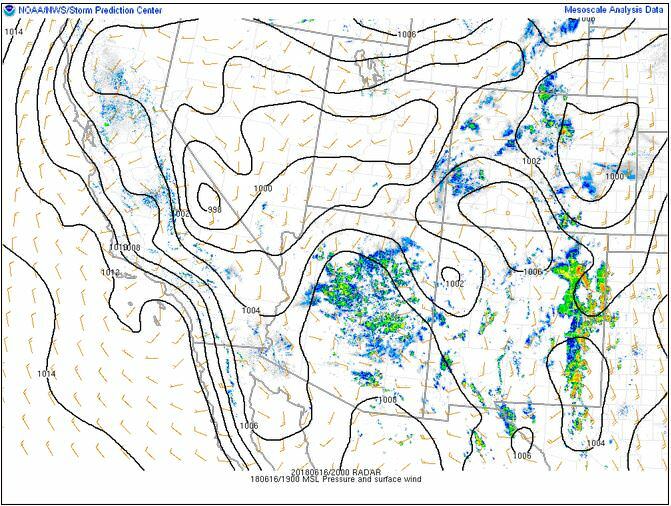 The RAP shows that thermal low pressure is expected to develop over the eastern slopes of the Colorado Rocky Mountains in the next six hours. No strong pressure gradients are expected with this thermal low. The NAM 250 mb chart shows moderate southerly flow as an upper-level low pressure system develops over southern California, ejecting into New Mexico today. The HRRR simulated reflectivity shows scattered showers and thunderstorms in the afternoon. These storms will eventually congeal into a line that moves out of the state this evening. 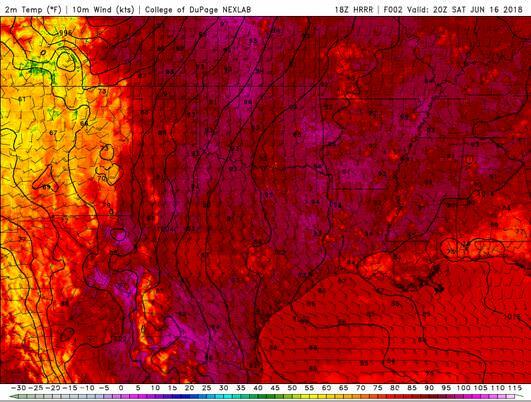 The HRRR predicts that the high temperatures for the Rio Grande River Valley will peak around 22 Z, reaching into the mid-70’s. Temperatures are MUCH cooler today than they were yesterday! The HRRR shows that the winds will not be very strong. This chart has been excluded from today’s post. 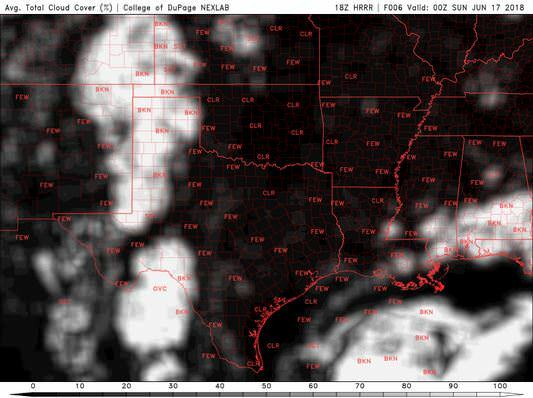 The HRRR shows cloud coverage is expected to drop this evening. My garden and trees are so thankful for today’s rain. I think we’ve had around a quarter of an inch so far, and I can already see the leaves on my cherry tree perking up. I was going to go for a bike ride today and a backpacking trip this evening, but we decided NOT to go in the rain. 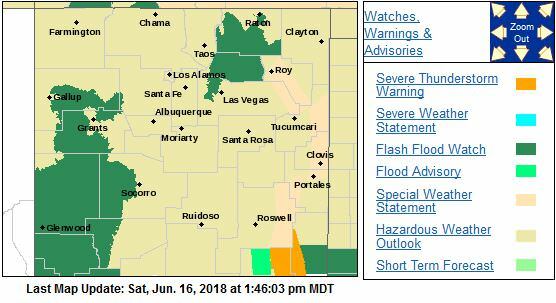 This entry was posted in Local WX, Practicing Concepts, Predictions, Radar Imagery, Satellite Imagery and tagged albuquerque, Belen, flash flood watch, forecast, Los Lunas, magdalena, Marginal Risk, meteorology, New Mexico, nmwx, Socorro, weather. Bookmark the permalink.